THE HUMAN NOTION OF "INVESTMENT"
ARE MARINE LEATHERBACKS ON THE BRINK? HOW DID A CHAIR BECOME A CHAIR? "Bravo, bravo! It was an absolute joy to read. As you'll see from the long gaps between comments, I often became so immersed in the story that I forgot I was reading to see what was missing. You both weave together rich ideas, science, personal narrative, facts, and exposition in a very nimble way. What I appreciated most was the time you spent on everyday subjects: hummingbirds, copepods, tea, and Chinese emperors—and how you made these things relevant to universal experiences. You truly evoke a profound sense of wonder for LIFE. Better yet, you inspire readers to examine the makings of their own LIFE, as a trustee, beneficiary, and participant in this ongoing narrative of relationships. "At first I was hoping for some more philosophical discussions of what we're to make of all this, or how we ought to live—not in a prescriptive sense, but more in the way of ideas. But, the end really drives this home." "Let's go back to a very important beginning, a childhood event with mystery and emotional connection that exposes us unknowingly to an uncontaminated truth of the human spirit for the first time. An ancient union with nature, although we are no longer trained to recognize it. Having had a similar childhood experience as those described by Chris Maser and co-author Reese Halter, I wanted, but could not find, a willing ear as a child to describe the resulting feelings, much less avoid mockery, which reflect the loss of important cultural connections. This book recognizes these critically valuable events with nature as a portal to ancient wisdom and happiness. Although, as individuals, we may allow these experiences to affect us, we usually tuck them away to be lost in the illusions of modern economics instead of the miracle of natural systems. "This book reminds me, with strong scientific descriptions, that we all should cherish those first insights right up front, like a totem to tell again our relationship to all else. 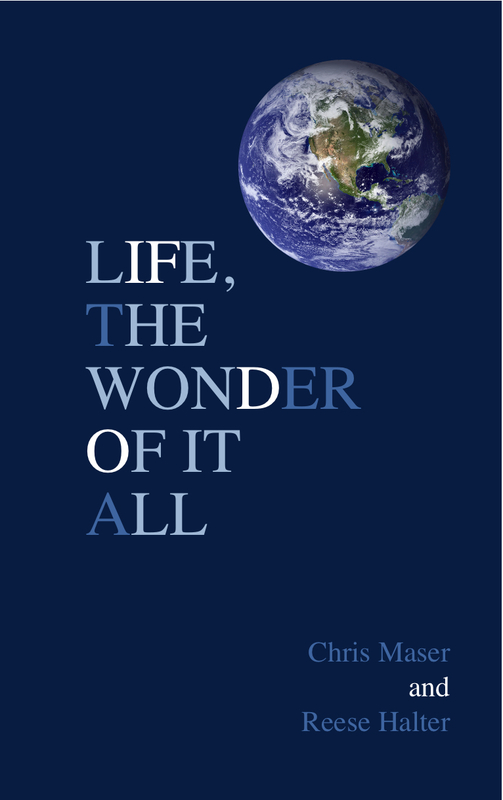 Chris Maser masterfully integrates different areas of science and ecological principles into a holistic understanding, like no one else I have ever known. Assimilating the scientific and its philosophical significance with cultural history, Chris sends the reader to peek above the clouds of political spin, economic growth models, agricultural production models, and general utilitarian nonsense to vividly see the parts with the whole and the reason we must all take responsibility to protect ourselves (with a far greater understanding as to what, when, where, and why) from loss of the very elements of nature that make life worth living, and so prevent our own demise." "The overall concept—tracing life's myriad interconnections from the big bang to the Earth's present sorry state—is wonderful! You have given us many moments of beauty: your wondrous ditch; the miracle of dragonflies; the notion of conduit; the fall of snowflakes. For me, the narrative itself is at its best when it focuses on these specifics. Of course, you need the larger concepts to hold it all together, but it is these small and individual moments I look forward to as a reader. "By the time you get to Nature's Commons, and introduce the concept of living trust, I realize how carefully you have laid out the steps of the journey. I think you have prepared us well for the emperor's wise gardener and the notion that each of us internalizes the wonder you have described. "Thank you for giving me the opportunity to read and comment. I believe this will be a volume many of us will treasure: read, pass on but insist on getting it back for a second and third read."